Discussion in '2nd Gen. Tacomas (2005-2015)' started by aggiepack, Oct 23, 2010. Just installed the black/grey Coverking bench seat cover last night in my reg cab taco. IMO they definitely add a nice touch...and even more? Without the seat cover my back would drive me crazy when I would drive for 1 hr. + at a time; the curvature of the bench seat (again, my opinion) is a little too much in the lower back region. When I was driving around with the new seat cover on this morning I noticed a MAJOR difference - the extra "umph" and cushion the cover added filled that empty space, and the pain and discomfort was noticeably gone. 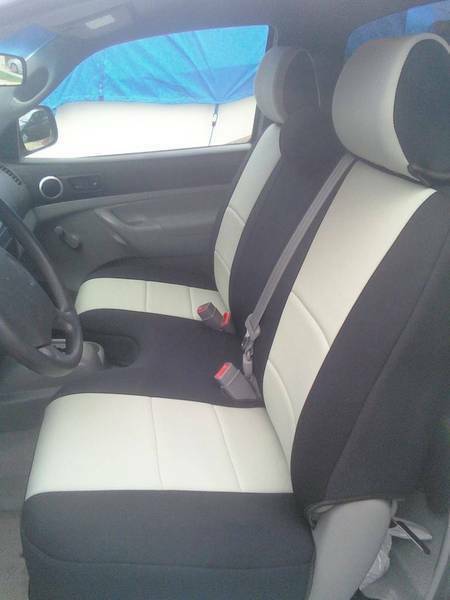 For those of you who have seat covers, have you noticed a difference?